Mary appearance = Chameleon of hell! NOVEMBER 11, 2012 REVELATION OF GOD: THE LORD GOD SPEAKS ABOUT THE WORSHIP OF STATUES AND MARY WORSHIP: SHE IS NOT A QUEEN OF HEAVEN, BUT FROM HELL! FOCUS ON KING JESUS, KING OF KINGS! Hello, welcome! On November 11th, 2012, the messenger angel of God brought on the following message to Prophet Benjamin Cousijnsen, which I’d like to share with you. Shalom, Benjamin Cousijnsen! I greet you in the name of Yeshua HaMashiach, Jesus Christ. My name is Saraia. I am a messenger angel of God and ask your attention! Revelation 13, verse 15 And it was given to him to give breath to it, to the image of the beast, that the image of the beast should both speak, and cause as many as wouldn’t worship the image of the beast to be killed. Benjamin, satan can do many miracles, and he tries to deceive the people who dwell on earth. Also in 1996, in the place Worcester, Massachusetts, blood came out of a tabernacle statue. 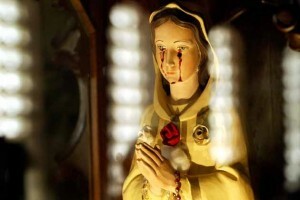 In Mexico, Bosnia, Spain… blood or tears came out of the eyes of the images. Many came to faith and worshiped the image! Leviticus 19, verse 4 Turn you not unto idols, nor make to yourselves molten gods: I am the LORD your God. Jeremiah 8, verse 19 Behold, the voice of the cry of the daughter of my people from a land that is very far off: isn’t the LORD in Zion? Isn’t her King in her? Why have they provoked me to anger with their engraved images, and with foreign vanities? not by an image or a Mary appearance, which says to you to pray through her, your ‘mediator’! No one comes to the Father except through Me. Not through this devilish spirit, this chameleon of the darkness! I tell you, she is not a queen of heaven, but of hell! Focus on King Jesus, King of kings; that’s how it should be. Acts 7, verse 55 But he, being full of the Holy Spirit, looked up steadfastly into heaven, and saw the glory of God, and Jesus standing on the right hand of God. You there, satan worshipers, repent of your ways! The God of Isaac, Jacob and Abraham has already warned you previously. He who does not want to hear, will perish. I hate your idol images! I won’t let you go unpunished. Just wait and see! John 3, verse 19 And this is the condemnation, that light is come into the world, and men loved darkness rather than light, because their deeds were evil. Choose whom you want to serve! Is it your chameleon satan, or Yeshua HaMashiach, Jesus Christ, who wants to save you from his hand? The choice is yours, but be quick before He makes His choice.